This Zwilling J.A. Henckels Aurora stainless steel 3.5 quart saucier with lid is designed for efficient stirring and whisking because of its curved sides. This Aurora pan has is wide to allow for steam to escape so you can more quickly reduce sauces for maximum flavor. A flared edge on the Aurora saucier also helps to minimize drips as you pour! The cooking surface heats quickly and evenly due to 5-layer construction of aluminum interior and stainless steel exterior and cooking surface. Aurora stainless steel cookware is induction compatible. This beautiful satin finished cookware from Aurora is dishwasher safe. Zwilling J.A. 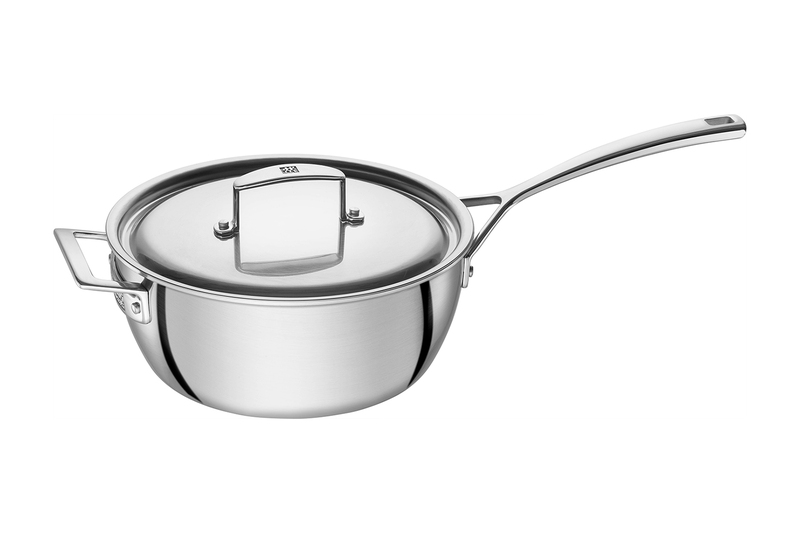 Henckels Aurora cookware is made in Belgium and comes with a lifetime warranty with normal use and proper care. A Zwilling J.A. Henckels Aurora 3.5 quart saucier with lid is an important cooking tool because of its versatility.